Cloud-based collaboration software has helped enterprises take meetings beyond the conference room. Now Cisco Systems is bringing its Spark cloud platform back inside. 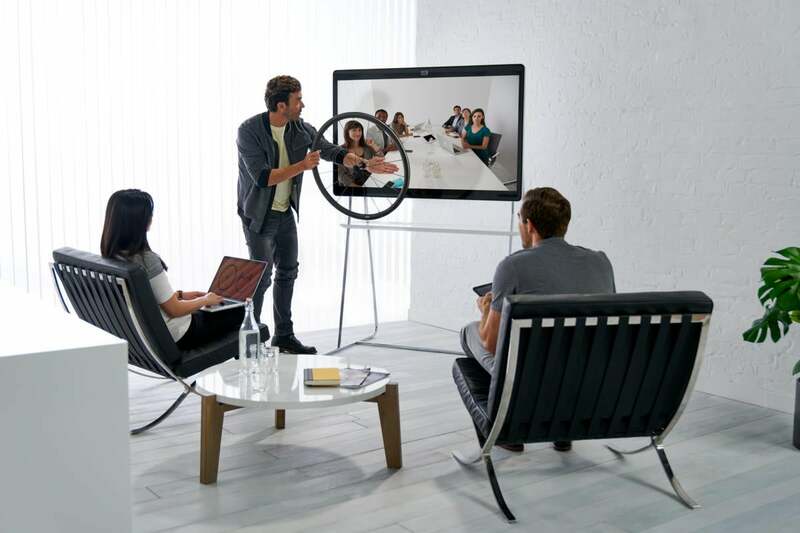 On Tuesday, Cisco introduced the Spark Board, an all-in-one collaboration device that can be a screen-sharing presentation tool, a digital whiteboard and a videoconferencing display. It’s designed to make it easier to set up and use connected conference rooms, taking the place of a hodgepodge of components that are managed and operated separately. After selling various voice and video tools for years, Cisco has made Spark the centerpiece of the company’s collaboration portfolio. It’s a text messaging, voice, videoconferencing and presentation platform that runs completely in the cloud, with encryption, so meeting participants on the road can use all those functions. Through the cloud, a Spark session can also incorporate older Cisco tools like WebEx and Telepresence. Spark competes with many collaboration environments centered on chat, including Slack and Microsoft Teams. Likewise, the Spark Board will go up against a few devices already in the market, such as Google’s Jamboard and Microsoft’s Surface Hub. “There is demand for digital whiteboard solutions to support agile team collaboration,” Gartner analyst Adam Preset said. Easy integration with Cisco’s broader collaboration portfolio should be a selling point for its products, at least for current Cisco customers, he said. Here’s how the Spark Board works: A presenter comes into a meeting room carrying a PC with Spark and walks toward the screen. The devices find each other with ultrasonic signals and the Board displays a greeting. Then the user hits a Share button in Spark to start presenting on the screen. This works with any Spark Board in the world, because all the content is shared in the cloud, Cisco says. Presenters can show slides, call up documents, and run video sessions on the Board from the Spark app. Remote participants can follow along on their mobile devices. Meanwhile, the digital whiteboard is interactive, so all participants can draw on it at the same time. Cisco is also adding group whiteboarding to the Spark app, so users can do it even without a Board. The Board includes a 4K video camera with a wide-angle mode to show the whole room and a short-range setting to show the presenter. It has 15 built-in microphones with beam-forming technology that can find and isolate the voice of the participant who’s currently talking. The 4K display will be available in a 55-inch model at the end of this month and in a 70-inch version later this year. The 55-inch Spark Board will cost US$4,990, plus $199 per month for software and cloud services. One of Cisco’s main goals was to simplify meeting-room technology. The Board can eliminate projectors, speakerphones, video screens and whiteboards that usually work separately, said Jonathan Rosenberg, a Cisco Fellow and vice president and CTO for the company’s collaboration business. Because all participants meet on Spark, the same service that runs on the Board, it doesn’t take any effort to make sure all elements of the meeting are available to everyone, he said. Consistency in collaboration tools, across both client software and dedicated systems, can save a lot of trouble, Preset says. “The worst thing you can do in a meeting room is have something in that room that only works with another room,” he said. One glaring omission in this version is integration with Spark Meeting Notes, where users prepare for and follow up on meetings, Gartner’s Preset said. Cisco plans to add more functionality to Spark Board over time. All whiteboard work is saved automatically within Spark, so users know where to find it. Surprisingly, at first the system will only allow for sharing the finished results of a whiteboard session. Depending on how customers end up using the feature, Cisco may add a replay feature so participants can see the work as it took shape during the meeting.